Scudder Falls Bridge is a non-redundant, girder plate bridge over Delaware river. Image courtesy of Aerolin55. Scudder Falls bridge forms a 4.4-mile section of Interstate-95 highway. Image courtesy of Famartin. The Scudder Falls Bridge replacement project will replace the existing four-lane bridge with a six-lane one. Image courtesy of Famartin. Located between Lower Makefield Township in Bucks County, Pennsylvania (PA), and the Scudders Falls section of Ewing Township in Mercer County, New Jersey (NJ), the bridge is a key link connecting the two northeastern states. The bridge handles more than 58,000 vehicles a day, which is significantly above its design capacity. The bridge witnessed no substantial improvements since its launch, nearing its useful lifespan and is also considered functionally obsolete by the National Bridge Inventory. A replacement bridge was, therefore, planned by the Delaware River Joint Toll Bridge Commission, the operator of the bridge. The project will increase the capacity of the bridge, reduce travel time, improve safety, and clear one of the worst traffic bottlenecks on the highway. The replacement project will enter mainstream construction phase in late-2017 and will take 4.5 years for completion. Phase one of the project will be completed and opened to traffic in 2019, while phase two will be completed in 2021. Scudder Falls Bridge was first opened in 1961, even though its construction was completed in 1959. It is heavily used by the commuter traffic especially during weekday peak travel periods. The recurring peak-period traffic is observed to cause 27min of increased travel time a day. The bridge also poses serious safety issues, recording more than 100 accidents a year. Even minor accidents and emergencies cause extended periods of traffic jams due to lack of bridge shoulders, poor sightlines and roadway geometry at the abutting interchanges. The non-redundant, pin-and-hanger-connected two-girder design of the bridge is no longer permitted by the US Federal Highway Administration. Including two primary load-carrying members (beams), the design is likely to collapse if one of its beams fails. 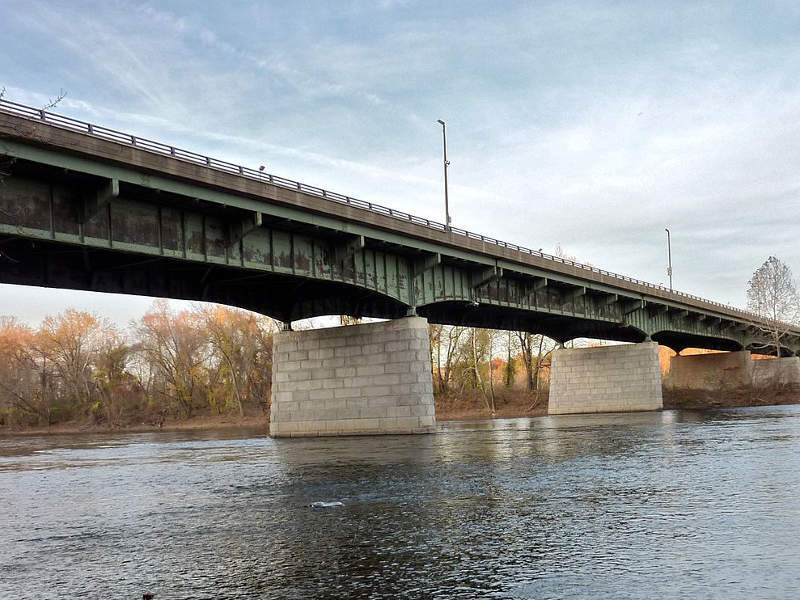 With the collapse of I-95/Mianus River Bridge, a similarly designed bridge, structures with non-redundant design in the country are being considered either for modifications or replacement. The US Toll Commission also proposed replacement of the bridge, reconfiguration and/or reconstruction of its adjoining interchanges, as well as other improvements along the highway approaches. 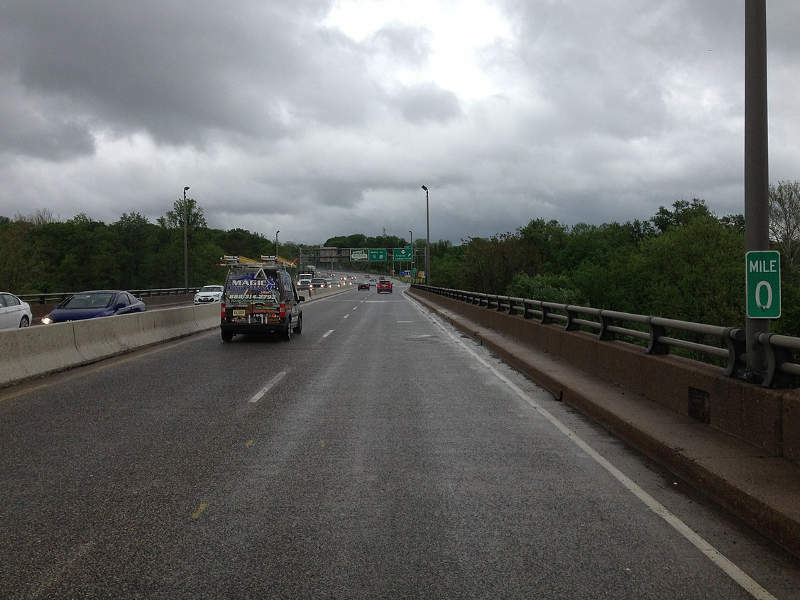 The Scudder Fall Bridge extends 4.4-miles (7.08km) from Route 332 interchange in PA and Route 579 interchange in NJ. The replacement project will construct a new bridge parallel to the existing structure. The new bridge will have a dual-span structure with three lanes in each direction. It will also feature three auxiliary lanes for merging traffic on and off the bridge. The project also includes reconstruction of the entire I-95/Route 29 Interchange (Exit 1) along with its associated ramps and structures, renovating Route 29/175 interchange to improve its safety and efficiency, reconfiguring the I-95/Taylorville Road Interchange (Exit 51), widening the I-95 approach by the addition of a single lane and full shoulders in each direction, and constructing inside and outside shoulders on both replacement bridge spans. 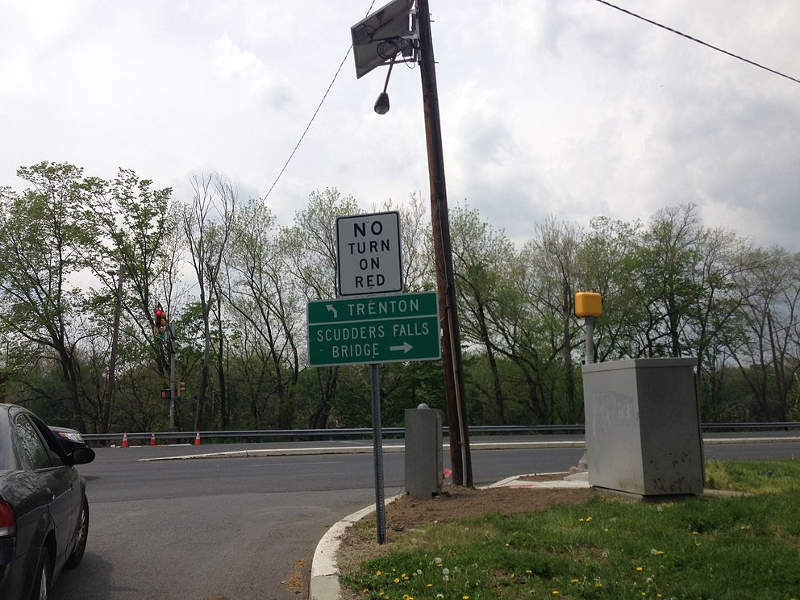 Other major improvements include drainage upgrades, improvements along the approach highway between 29/175 interchange and Bear Tavern Road in NJ, as well as the development of a bicycle/pedestrian walkway alongside the main river bridge. A new all-electronic toll (AET) gantry and associated infrastructure will be installed in the southbound direction of the bridge. The cashless tolling system will feature highway-speed E-ZPass tag readers and high-speed video cameras for license-plate billing. Six 12,5000ft-long noise-abatement walls will be constructed in both directions of the approach roads leading to and from the bridge in order to mitigate noise pollution. Other sustainable measures include installation of bird shelters in the vicinity and bird deterrents beneath the bridge. The construction is planned in such a way that the traffic movement across the river is least affected, enabling the current bridge to be operational during the new bridge construction. The construction is planned in two phases, with phase one involving the construction of a new four-lane-wide span bridge immediately upstream of the existing bridge. The bridge will be open for both northbound and southbound traffic upon completion of the phase one. During the second phase, the old bridge will be closed for traffic so that it can be demolished, while the second span of the new bridge will be constructed. The second span will start carrying northbound traffic, while the first span will carry the southbound traffic, upon full completion of the project. A $396m construction contract for the replacement project was awarded to Trumbull Corporation. Michael Baker International secured a $22.49m contract as a prime consultant for the bridge design. The scope of the contract includes overall project management, bridge design, roadway design, environmental coordination and geotechnical engineering services. The construction inspection services contract was awarded to three engineering firms, including Parson Brinckerhoff, TRC Engineers, and Gannett Fleming. The three firms will monitor and oversee different sections of the project area. They are also responsible to ensure that constructions works and materials are in accordance with the commission’s plan and specifications. A $11.39m construction and engineering contract for the construction of noise walls was awarded to PKF Mark III, while Jacobs Engineering is responsible for monitoring and overseeing the construction of the same.